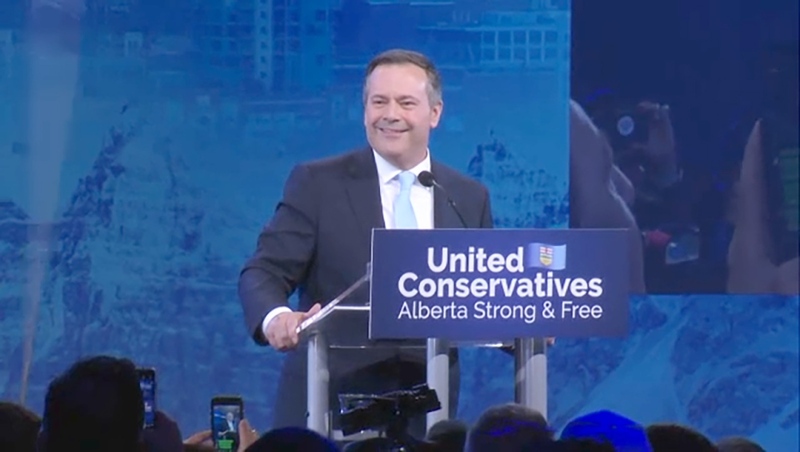 The United Conservative Party has won a majority government in Alberta. 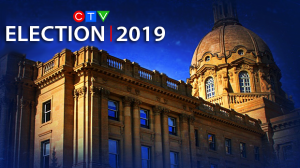 It will be some time before all ballots are counted but the UCP is leading or projected to win in 63 ridings, with 44 needed to form a majority. The NDP is leading or projected in 24 ridings. "Friends, today our great province has sent a message to Canada and the world. Alberta is open for business," a beaming UCP Leader Jason Kenney declared. "This democratic decision is a message to all of those Albertans who are struggling. To the unemployed, to those who have given up, to the small business owners barely hanging on. To the young people who got their degrees and diplomas but can't find work. To those who lost their homes and their hope after years of economic decline and stagnation. To them, we send this message, help is on the way and hope is on the horizon." Speaking to supporters from the party's headquarters in Edmonton, NDP Leader Rachel Notley said she will stay on to lead the official opposition. "Four years ago, Albertans hired us to do a very big job at a very difficult time," she said. "We did that job with purpose. And we did it with integrity. And today, Alberta is a better place because of it." Kenney has said that his first order of business will be to scrap the provincial carbon tax. He has also threatened to enact legislation restricting the flow of oil to B.C. in response to that province’s opposition to expansion of the Trans Mountain Pipeline. He has also pledged to hold a referendum on the federal equalization program, meant to even out fiscal disparities between the “have” and “have not” provinces, if there's no major progress on market-opening pipelines. That vote would happen on Oct. 18, 2021, the same date as the next municipal elections in Alberta. And Kenney also vowed to take Ottawa to court over the contentious Bill C-48 and Bill C-69, which will limit oil tanker traffic off the coast of B.C. and change how energy projects are approved. On healthcare, Kenney has said the UCP won’t make cuts, but critics argue the party’s plan to request a review to find efficiencies within 90 days of taking office would equate to the same thing. Kenney has also pledged to get rid of legislation that prevents parents from being notified if their child joins a Gay Straight Alliances at school. There are about 70 GSAs in Alberta, which welcome and act as a support for children from different gender identities and sexual orientations. Liberal Leader David Khan failed to win a seat in Calgary-Mountain View, meaning the party will have no representation in the Legislature. Speaking to supporters, Khan said the party will continue. "This was not our election but this is not the end of the Alberta Liberal Party. We will regroup, reload and carry on," he said. "We will continue to advocate on the important issues. Poverty, climate change, job creation and education." New this year was the ability for Albertans age 18 and over to mark their ballot at any polling station in the province during the five-day advance voting period. And a record number took advantage. About 696,000 advance votes were cast, well above 2015 when 235,000 people voted ahead of election day. The high number means some results could be delayed as 223,000 people voted outside their home riding. Those ballots were sealed and sent to the Elections Alberta headquarters in Edmonton and officials will begin counting them at 1 p.m. Wednesday. Jobs, the economy, and the need for increased pipeline capacity were the main issues during the campaign but there was also plenty of controversy. At least three UCP candidates withdrew or were disqualified by the party after controversial comments were brought to light, and another was removed after posing for photos with members of a white supremacist group. RCMP also served a search warrant at an auto repair shop owned by Peter Singh, the UCP candidate for Calgary-East. Probes have also been launched by the provincial election commissioner and the RCMP into allegations of illegal campaign donations being made to the Jeff Callaway campaign for the UCP leadership, which was won by Kenney. Several people have already been fined by the election commissioner. There have also been allegations Callaway ran a “Kamikaze campaign” to undermine Kenney’s main rival, Brian Jean. Party leaders have also called this one of the most divisive campaigns in recent memory, with each accusing the others of resorting to mud-slinging rather than debating policy.